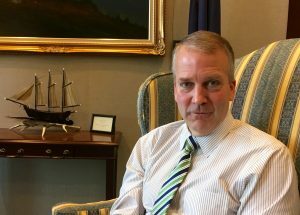 When new members of Congress take the oath of office on Jan. 3, Sen. Dan Sullivan will give up an unsought distinction: The Alaska Republican will no longer be last in Senate seniority, No. 100 out of 100. Seniority is a big deal in the Senate. It can determine where your office is, which committees you sit on and, often, when you get to speak at a hearing. Sullivan says it didn’t bother him being dead last. In 2017 he’ll be 93rd on the seniority list, and 92nd if Sen. Jeff Sessions resigns to become attorney general. In a way, Sullivan says he actively worked to keep himself low in the pecking order, by spending a lot of time this year campaigning for his fellow GOP senators. Sullivan also raised money for Republican candidates, through his leadership PAC, True North Political Action Committee. Members of Congress have leadership PACs to raise money for their colleagues, and often their party. Federal records show True North raised and spent more than $400,000 over the past two years. Sullivan claims multiple accomplishments for the year. The one that seemed to be the longest shot was convincing the Army to reconsider downsizing a brigade combat team at Joint Base Elmendorf-Richardson. Sullivan, a reserve officer in the Marines, worked his position on the Senate Armed Services Committee. In the final hours of the session this month, Congress passed a water resources bill. It advances work on harbors across Alaska. Sullivan says he authored a section that would send $300 million over five years to small communities that lack basic water and sewer service. “The numbers got cut down, which wasn’t great, but that made it,” he said. He’d originally asked for nearly five times as much. Sullivan says he also took on a new cause. Sullivan convened a “wellness summit” on the topic in Palmer this summer, and he says he’s pleased Congress passed two anti-drug bills. “The 21st Century Cures Act has $1 billion for opioid treatment that … hopefully Alaska is going to see a significant amount of that,” he said. Even with the lowest seniority in the Senate, Sullivan got important committee assignments for Alaska: Armed Services, Veterans, Environment and Commerce. He’ll keep them in the new Congress. But, according to his spokesman, he’ll put in for a better office suite. The bump in seniority will help.